Last night, I dreamt that the food court near my house had been redesigned and my first fear was this: Did they take away the Taco Bell? I was walking through the mall when the familiar sights faded into one shocking image: three tiny food counters, and one huge green restaurant. Where is the Taco Bell?! I wondered frantically. I scanned the parameters, my heart beating. There was a KFC; that wasn’t there before, and Taco Bell is their partner. Could it be? And yes! The signature Taco Bell purple was splashed across KFC’s counterface. Relief washed over me like a pack of Taco Bell hot sauce (I love those). So…has anyone else dreamt about food in this insane manner? It’s common knowledge that I have loved Taco Bell for the past 7 years. Sure, I ate it before then, but I didn’t become addicted to it until 7 years ago. Ever since, I need Taco Bell, crave Taco Bell, and eat Taco Bell at any opportunity. It’s not like I go out of my way to find it, but if I know it’s in the area, I plan my schedule so that I can end up with that burrito or taco supreme in my hands by the end of the day. As you can tell by the recipes on this blog, I have a thing for Mexican food (or our version of it). Yummy! As a vegetarian, I find it difficult to procure a “good” fast food meal while on the road. When my family goes on a trip, I hope there’s a Taco Bell in the area. If not, say hello to veggie burger, and say good-bye to a salad (I’m not a rabbit–I need more food than that!). Do you have a favourite vegetarian-friendly fast food joint? Confessions of a Vegetarian: I don’t love vegetables! Confessions of a Vegetarian: What, you don’t eat no fish?! What happened to the daily updating that was going on? That’s what you may be asking, and I ask myself the same thing. Things have gotten very busy this week with school and my writing. Last night I attended a “fun-raiser” for On the Danforth magazine. It was so much fun! On a vegetarian topic, I would like to thank my friends for mothering me to eat my vegetables. I ordered a veggie fajita and the stuffing encompassed cooked carrots, broccoli, cauliflower, onion, and red and green peppers. I don’t know about you, but I don’t eat vegetables in my fajitas unless they’re red or green peppers (see my taco recipe). Haven’t they heard of beans I am proud to say I ate my vegetables! Not all of them, but I did snack on some broccoli and carrots. Thank you, dear supportive friends who read my blog and reminded me of my beanian way of life. Okay, I eat this almost every night. I once ate it daily for a year, but nachos are better meant as a sort of dessert every once in a while. You KNOW you love nachos! They make a great snack for any party and can be modified to accommodate your favourite ingredients. 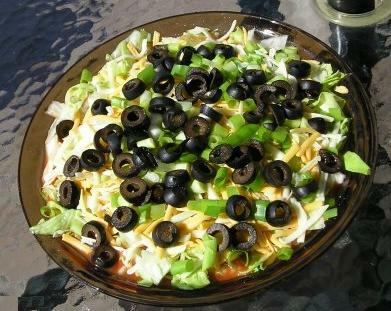 Note: You can omit the sour cream, green onions or black olives if desired. Preheat toaster oven (or oven) to 325°F convection. 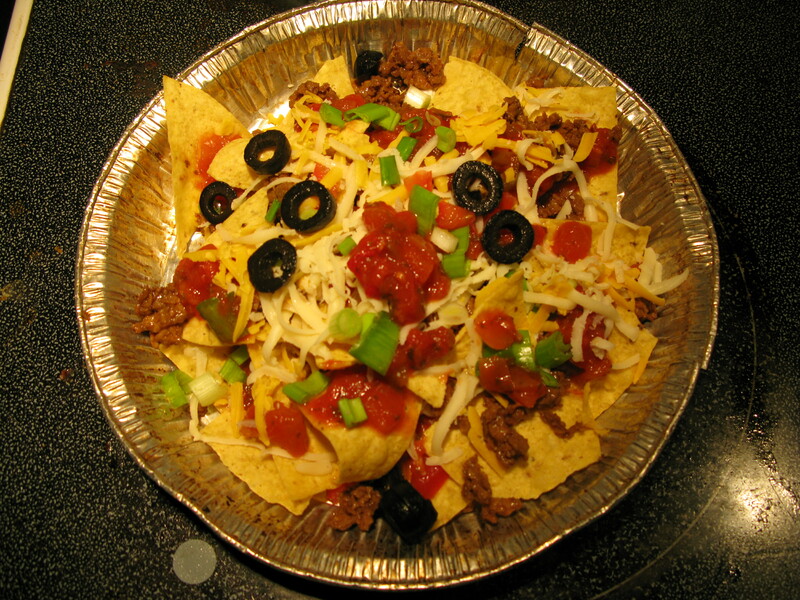 In the aluminum pan, lay out one layer of nacho chips. With a spoon, sprinkle the desired amount of salsa across the chips. Optional: Repeat step with sour cream. Sprinkle cheddar cheese across all the chips, over the salsa. Over the cheese, sprinkle green onion and black olives. 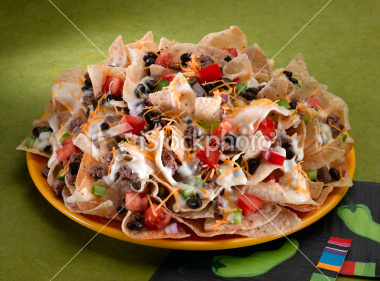 What are your favourite nacho ingredients? How do you prepare your chick peas? 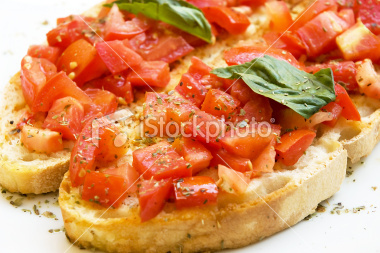 I eat them cooked in tomato sauce with an addition of a thin pasta or pasta shells. The other method is cooked plain with parsley and a bit of moisture; it acts as a great snack!